Explore the endless possibilities with Palay Display’s Park Avenue Perimeter Outriggers. Start with The Park Avenue Perimeter Outrigger core system and then add the components you desire. You'll be amazed at how The Park Avenue Perimeter Outrigger transforms your retail space. Your sales will also be improved just by adding in The Park Avenue Perimeter Outrigger! Palay Display also offers all the brackets, shelving, display tables, and other accessories to outfit your Park Avenue Perimeter Outrigger. Palay Display offers complete basic store displays to more elaborate retail fixtures, whatever your needs may be. If you have any questions about our Park Avenue Perimeter Outriggers or any other Palay Display Store Fixture Collection, please call or chat online with one of our knowledgeable sales representatives. Palay Display has been selling store fixtures and retail displays since 1945! The Park Avenue Perimeter Outriggers are a great option for any specialty shop, retail store, or boutique setting, to name a few. Start with the basics, and add in all the accessory components to create a complete store display with the Park Avenue Perimeter Outrigger. If you can't find the right Park Avenue Perimeter Outrigger, please chat online or call one of our knowledgeable sales staff who can assist you. 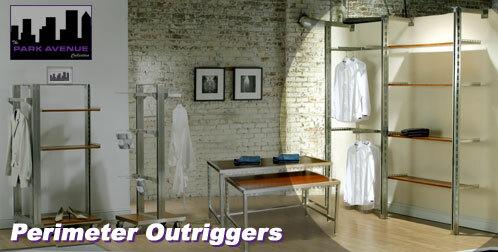 Try an upscale veneer shelving system for your Park Avenue Perimeter Outrigger. This shelving is available in a selection of finishes, sure to meet your needs. Your boutique setting, complete with designer shelving for your Park Avenue Perimeter Outrigger, will look fabulous to your potential customers. Palay Display carries everything you need to outfit your Park Avenue Perimeter Outrigger. From accessories such as hangrails, brackets, clothing racks, and more, you will find the right items to complete all your store displays. If you can't find the right Park Avenue Perimeter Outrigger or accessory, please chat online or call one of our knowledgeable sales staff who can assist you. The Park Avenue Perimeter Outriggers are a great place to start if you are trying to set up an upscale, fashionable display for your store. The Park Avenue Perimeter Outrigger and accessories are fashionable, yet economical, making it a smart choice. If you can't find the right Park Avenue Perimeter Outrigger, please chat online or call one of our knowledgeable sales staff who can assist you. Try a nesting table set for your Park Avenue Perimeter Outrigger. Available in several different finishes, these tables are sure to complement your Park Avenue Perimeter Outrigger. Explore all the available, endless options to customize your displays. Try a clothing rack, such as a 2 Way or 4 Way Floor Display, for your Park Avenue Perimeter Outrigger. Pick from a selection of different finishes and hangrail options to complete your Park Avenue Perimeter Outrigger. See your sales increase dramatically with an attractive display using The Park Avenue Perimeter Outriggers! Palay Display carries all your store display and fixture needs, from complete display sets to accessories and more. Try The Park Avenue Perimeter Outrigger core system and pick from different add ons and accessories to create your own custom display. Watch your sales increase with an attractive Park Avenue Perimeter Outrigger!